Adult swim lessons with Peter and Cassidy: learn the basics or strengthen your swim skills! Peter Cutting continues his quality instruction of adults on Tuesday evenings. Peter meets each student where he/she is and is capable of helping each student make advancements in their swimming skills. He has worked with the meekest Beginner to the student who just wants to improve breathing or stroke technique or learn more advanced strokes. He is able to allay fears and inspire advancement in all students. Class size is limited to 5. Our newest adult instructor is not new to Wayside at all. Cassidy Grace has been an instructor and lifeguard at Wayside for many years. She is skilled in swimming knowledge and teaches with understanding, patience and encouragement. If Sunday mornings are your opportune time to learn to swim, Cassidy is waiting to show you how. Class size is limited to 3. Sign up for the time slot that works best for you! Each class meets one time per week for 30 minutes. For those looking for a one-on-one lesson, Wayside offers private lessons for adults to accommodate busy schedules. Weekday morning private and semi-private lessons with Beth! For additional information or to schedule group or private lessons, please contact Aquatics@WaysideAthleticClub.com or 508.481.1797, extension 26. 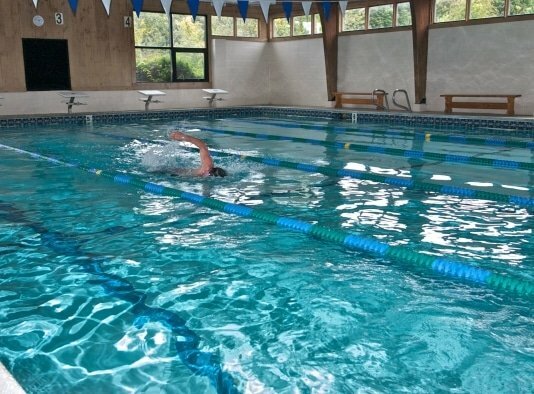 Wayside offers several ways in which to get fit in the pool. Ideal for those who are looking for exercise that is easy on the joints as well as for those who recognize the benefits of working in the weight-free environment of the water, using the water itself as resistance. 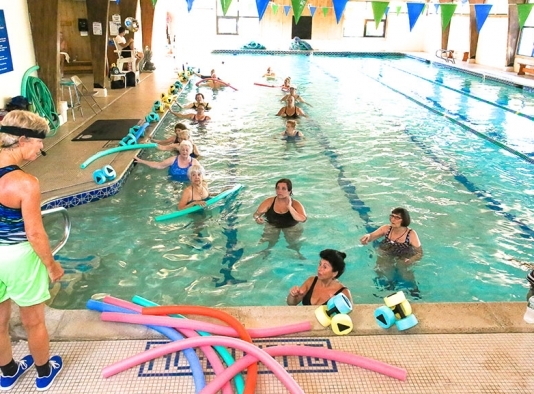 Water fitness classes are perfect for pregnant women, too! Our new class formats, Aqua Fit, Aqua Deep, Aqua Walking Plus, Aqua Power & Strength, Aqua Flexion and Aqua Boot Camp offer low to high intensity workouts to suit everyone. Daily classes are scheduled in our Indoor Pool. Check out the NEW Water Fitness Schedule below!